“Is my conversion rate good or bad?” We built Littledata’s benchmarking feature to help you say goodbye to guessing games and start automatically benchmarking your site against top performers. Now that our benchmark tool has been around for awhile, we’ve started to get a sense for which ecommerce sites are using it most effectively. In other words, we’ve seen how benchmarks can help websites increase revenue – not in theory but in actual practice. Littledata has now helped hundreds of companies understand where their performance is compared with other websites in their niche, using our benchmarking algorithms and clean user interface. But can benchmarks really help you grow sales? I understand if you want to see the data for yourself. One of our long-term customers makes for an ideal case study. Over the course of 2017, we helped Pufushop, a Romanian ecommerce site, understand if their website changes were helping to increase performance – and where they still had work to do. Pufushop is a retailer of baby goods, with a main focus on baby carriers. The products in their store are all premium quality and from top vendors, so comparing them with just any other baby store wouldn’t have been relevant. Instead, we compared their ecommerce metrics with specific benchmark segments that were most relevant to their market landscape and business goals. Benchmarking is used to measure and compare the performance of a specific indicator, and it’s most useful when you map that data onto your internal KPIs and compare performance against similar sites. Littledata specialises in ecommerce analytics and our benchmark population now includes Google Analytics data from almost 10,000 sites. We break that data into specific categories, such as Marketing, Ecommerce and Speed (site performance), and within each category you can filter by industry, location, website size, and more. Web behaviour is not necessarily consistent across industries. We started Pufushop’s analysis by looking at key ecommerce KPIs such as Checkout completion rate, Ecommerce conversion rate and Add-to-cart rate, but we didn’t just pull these metrics blindly. Starting with the first month, February 2017, we looked at how other stores with a similar average basket value were performing. This helped our client establish what was working and what could be improved. As we worked with them to make sure everything was tracking correctly (after all, benchmarks are only as useful as your data is accurate), they could also check these benchmarks directly in the Littledata app. Now for the first time, both Pufushop’s Marketing Director and Senior UX Designer had clarity on which areas of the website could be improved to increase sales. Resolving those two main issues will automatically resolve the e-commerce conversion rate KPI and will indirectly influence the Revenue per customer. Pufushop decided to use Google Optimize in order to improve the checkout completion rate. 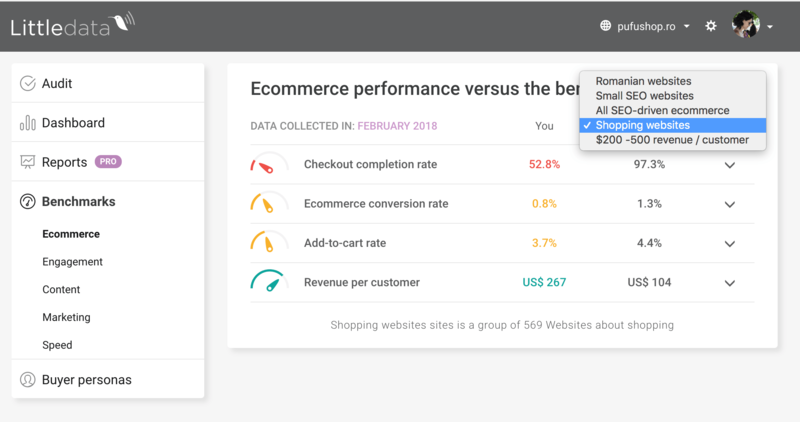 Using Google Optimize is an easy-to-use, fast and scalable tool in order to A/B-test different experiences on the checkout page. Now those are some real results! Having a direction as well as a target helped Pufushop’s digital team to focus on clear, achievable goals. As they continue to grow, we’re glad to have them as a part of the Littledata family. Ready to benchmark your site? 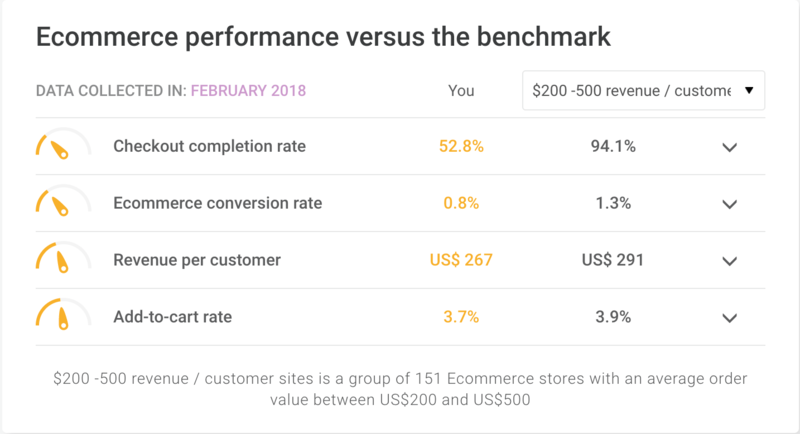 If you’re in the same place as Pufushop was a year ago, here’s a quick guide for how to use ecommerce KPI benchmarks to improve your store performance. Keep in mind that there are situations where the KPIs will show you issues of wrong messaging, for example of a product page or advertisement – technical issues where the change is fairly easy to make. In other cases, you will need to develop a long-term strategy for radical changes to your website, such as altering your checkout process. The online environment is a fast-moving industry, so you need to be agile and ready to change accordingly. Either way, we’re here to help you scale with data-driven strategies for sustainable growth. Now stop reading this post and start benchmarking your site! Note: In order to maintain data-confidentiality, KPI values have been altered in this case study (the results are real, only the benchmarks have been adjusted).